Our purpose is to share best practice and build skills, knowledge and networks among our public-sector members and private-sector partners. Our members include local and regional authorities, housing associations, development corporations, and SMEs. Our partners are leaders in the built-environment and policy arenas across London and the southeast. Our content is practical – the ‘how’ over the ‘why’ – and includes delivery-focused reports, engaging events and our bespoke Leaders programmes, which host 60 candidates and 60 senior mentors each year. 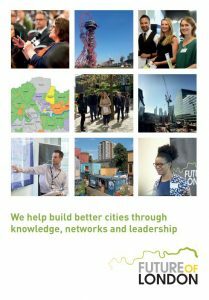 Our approach is to involve people from all levels of our network directly in Future of London projects through workshops, seminars, roundtables, field trips, and an annual conference. Our structure – an independent not-for-profit with a strong board, steering group and associate base – means we’re able to respond nimbly to the issues shaping the Capital’s future; to explore member and partner ideas; and to act on broader issues. Our core funding comes from membership and course fees, while grants and sponsorship help cover the cost of major projects and allow us to provide events and reports free of charge.